I first encountered Jean Tinguely in an exhibition catalog called “The Machine” that my dad brought home from MoMA in New York. Tinguely had built a “self-destroying” sculpture called “Homage to New York,” which exploded (almost) according to plan in MoMA’s sculpture garden in 1960. It’s hard to imagine that happening now. There are few chances to see his work in the US, but while wandering elsewhere I found the Stravinsky Fountain in Paris and The Fantastic Paradise in Stockholm, both collaborations with his wife Niki de Saint Phalle. 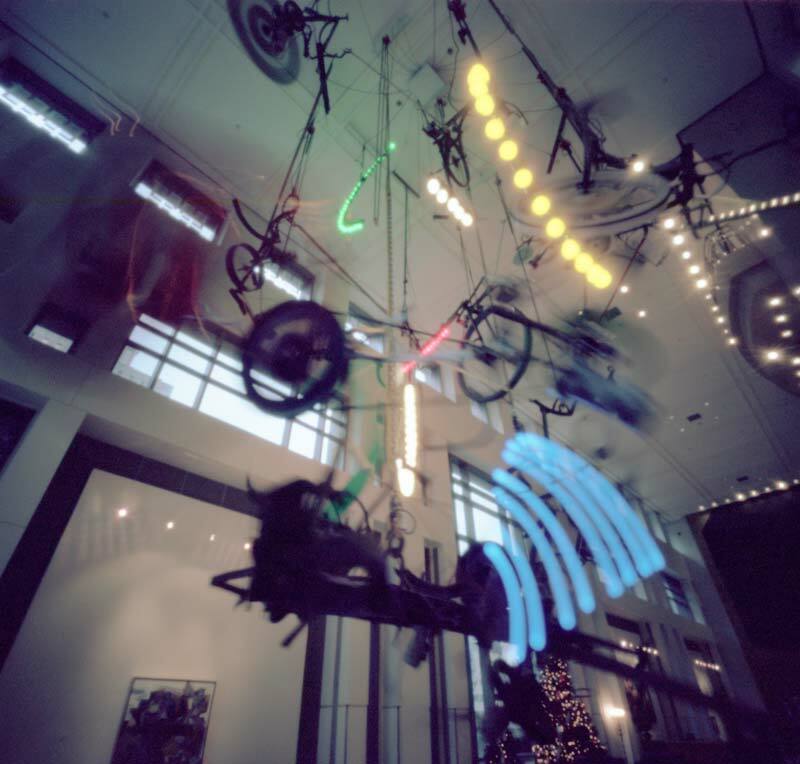 In 1991, Tinguely’s final large scale kinetic sculpture was dedicated, in the lobby of a new office building in Charlotte, North Carolina. I’ve stopped in to see it whenever I could, and this last time it looks like it’s been renovated – I remember visiting more than once when all the “moving” parts were static. These photographs were taken in December 2013, using a Zero Image camera and one that I built myself. You can see it move, here, in a video made by the Bechtler Museum. These are great, Jeff! 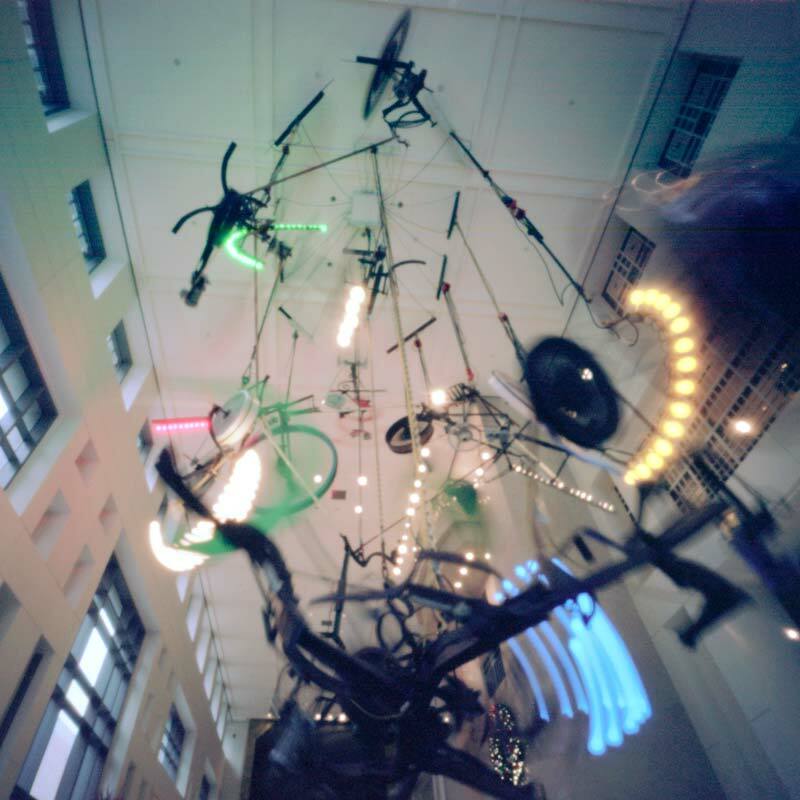 Tinguely sure has made some interesting art. Woohoo! Congrats on your first post Jeff! These are wonderful!